Benoit Renaud, a member of Québec Solidaire, writes on the decision to merge that party with another--and what this will mean for the left in Quebec. QUÉBEC SOLIDAIRE (QS) and Option Nationale (ON), two parties running in Quebec provincial elections, decided to become one organization at their respective conventions on December 2 and 10. The united party will keep Québec Solidaire's name as well as its bylaws and most its program. Its first big challenge will be to run candidates in the provincial general election scheduled for October 1, 2018. With QS's 16,000 members compared with ON's 2,000, it was understood that the merger would take the form of ON being absorbed by QS. But in exchange for letting go of their party, ON demanded that QS make some concessions on one aspect of its program, clarifying its commitment to a fight for independence for Quebec. For many QS members, this was a step in the right direction. For others, there is a fear that independence could overshadow other aspects of the program (ecology, feminism, social justice, etc.). These differences in the assessment of what the deal with ON means will now have to be resolved in practice. Before the vote on the agreement, announced in early October, there was a sense that the issue was far from settled, as vocal oppositions emerged in both parties. In QS, apart from the new definition of the role of the Constituent Assembly, there was strong criticism of the speed at which the resolution that was passed in May led to a deal, and also criticism that it was a "take it or leave it" proposal. For the ON opposition, the idea of joining a party clearly positioned on the left, one that some see as being on the far left, was considered counterproductive in the fight for independence--their idea being that independence is "neither left nor right." But to everyone's surprise, the decision to ratify the agreement and proceed with the merger was passed by approximately 85 percent at QS and over 90 percent at ON. Very few people have quit QS over the decision. A small group (a few dozen people) left the ON convention even before the vote took place in protest of what they claimed had been a flawed process. But in fact, these dissidents were against the merger no matter the process because they considered QS a gathering of "socialists and multiculturalists." 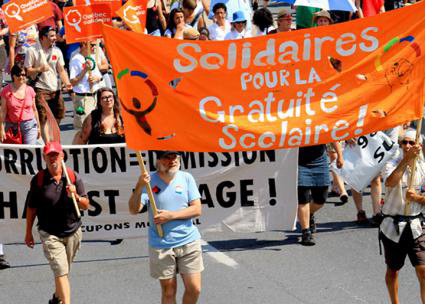 QUÉBEC SOLIDAIRE was founded in February 2006 following another merger, that of Union des Forces Progressistes (UFP) and Option Citoyenne (OC). UFP itself came from the coming together of three organizations back in 2002. Option Nationale was founded in 2011 following the departure of prominent Parti Québécois (PQ) Member of the National Assembly Jean-Martin Aussant, based on a criticism of the lack of any concrete strategy or plan on the part of that party to give new life to the fight for independence.
. Now, the combined forces of QS and ON, with possibly an influx of new members drawn by the energy of the merger, will have to demonstrate in practice that a determined fight for independence is not in opposition to an equally determined fight for an ecological economy, a feminist and participatory democracy, an end to poverty or the promotion of international solidarity. One sentence in the agreement mentions that the unified party will speak up equally against neoliberal austerity and Canadian colonialism. This last notion is understood by most people in QS and ON to mean both the fight for Quebec independence and complete solidarity with Aboriginal people's struggles for their own self-determination. The fact that there is a party soon to reach the 20,000 members mark, polling between 12 and 15 percent, and poised to get several people elected in a few months (QS currently has three members of the National Assembly), is electrifying for many. Fight for a living wage! Is voting out Harper enough?